The MSNBC host showed why the Republican political event of the weekend 'had a significantly different vibe' from a Democratic gathering she hosted. 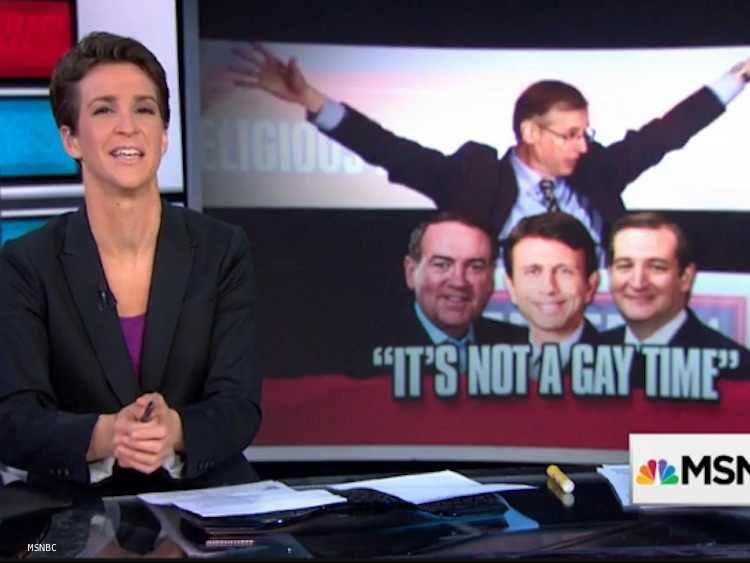 “It really was a ‘kill the gays’ call to arms,” said Maddow on her MSNBC program. Swanson, who preaches that homosexuality should be punished with death, drew more than 1,700 to his ”religious freedom" conference, including Republicans Mike Huckabee, Bobby Jindal and Ted Cruz. Maddow played a series of excerpts of Swanson’s speech, in which he quoted from the bible in calling for the death penalty for gays and lesbians, and then declared that was not as high a priority as giving homosexuals, and all of America, time to repent. “This was a Republican presidential candidates event,” Maddow told viewers. “These were not the ‘kill the gays’ ravings of the guy hosting this event from some time in his past. This was not something we dug up that he said a long time ago, that maybe these presidential candidates didn’t know about.” Maddow suggested the might be a good topic for the moderators from Fox Business Network who will put questions to Cruz and the other Republicans running for president Tuesday night. Watch Rachel Maddow break down the Swanson event in the clip below.